2002 AA29 is visible as a faint smudge in the image above. Because it was so faint and moving fast a set of 50 individual 30 second exposures were stacked together, so the stars appear as trails of dots and the asteroid as a single dot. This unusual asteroid travels around the Sun in an orbit very similar to the Earth, taking almost exactly 1 year to complete one circuit, It is inclined to the Earths orbit by 10° and has an even more circular orbit than the Earth. 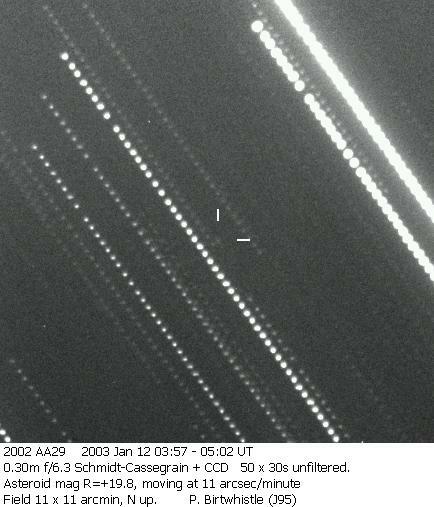 When the image above was taken 2002 AA29 was moving slightly faster than the Earth, in the eastern sky before dawn. From this close approach it will continue to move away from the Earth for about 95 years, eventually catching the Earth up again from the other (western) side. But at this point the effect of the Earth's gravity causes 2002 AA29 to travel slightly slower than the Earth and 95 years later the Earth catches 2002 AA29 up and the whole process then repeats. For more information see here for an interesting review co-authored by Paul Chodas of JPL who originally pointed out its unusual behaviour.